We’ll be developing a maker handbook as a deliverable in our project. Here are some handouts we’ve developed to date. Click on the header for the PDF. A list of many of the possible genres, tools, and materials used in many makerspaces. See what fits for you! We make these with Scotch double-sided foam tape, 10mm LED bulbs ordered from Tayda Electronics, and CR 2032 3V batteries from The Battery Supplier. Use this document to help formulate your organization’s collective idea of why you are engaging in making, what needs you are meeting, and what success will look like. These are design thinking tools that we have written to help introduce people of all ages to the process of design thinking. We’re still revising these, so if you have feedback we’d love to hear it! Outlines key ideas that librarians and educators without STEM experience can focus on when bringing STEM into their work, from the National Research Council’s Framework for K-12 Science Education: Practices, Crosscutting Concepts, and Core Ideas and later folded into the Next Generation Science Standards. Michigan-based crowdsourcing platform that includes features for offline donations, full- or partial-funding pathways, and extra support. Use this handout to help kids and families safely discover the insides of toys, appliances, and other electrified objects. We set out secondhand t-shirts at some of our MakerFest events along with these instructions. What would “Made” magazine look like if it featured your makerspace? This blank template for a magazine cover can be used by individuals or as a group exercise to examine the vision for your makerspace. Here are some additional resources we think you’ll like in the meantime. Jensen, Karen. 2016. “Small Space, Big Impact: Designing My Makerspace.” School Library Journal, Feb. 1. Accessed February 6, 2016, from http://www.slj.com/2016/02/technology/small-tech-big-impact-designing-my-maker-space/. 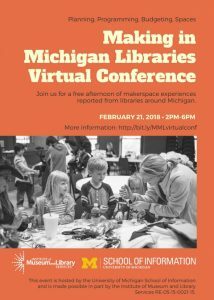 Public librarian Jensen discusses her six-month journey to set up maker activities in her public library with limited funds and space.